What do tulips, Pet Rocks, Beanie Babies, Barbie Dolls, real estate, stock markets, and gold, have in common? They’ve all seen speculative bubbles in their prices that burst with devastating results for investors who believed there would be no end to their rising prices. Should we believe claims that the stock market is now in another bubble? Some are making that claim. It is true there are several characteristics in the current market that were characteristics in previous bubbles. In prior bubbles prices were rising, as they seem to be now, based more on the excitement of the price action itself (the continuing rising prices) and the surrounding hype, with little thought given to the fundamentals. That is a worry. Then there is the evidence that even as public investors are pouring money into the market at a near record pace, institutional investors have been pulling money out at a near record pace. That has also been evident near prior bubble tops. A convincing argument can also be made from the surge in investor confidence that has margin debt (buying stocks with 50% discounts) at record levels last seen at the 2000 and 2007 tops. But as the old saying goes, records are made to be broken. 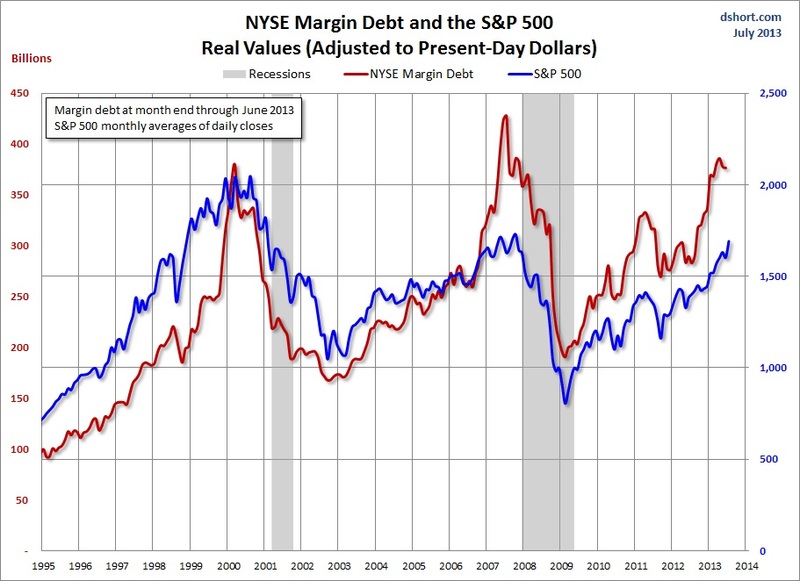 It was certainly worrisome in 1998 when margin debt reached a level not seen since the 1929 crash. But stocks continued higher for almost two years in that obvious bubble before topping out in 2000. It’s also true that social media type internet start-ups seem to be duplicating the path of the dotcom bubble of 1999. The success of the few original social media sites has resulted in hundreds of wannabe’s popping up to give it a try, names like Nexgate, Bloomfire, Prollie, Shiftgig, Evzdrop, CrowdTwist, Nestivity, BeFunky. How many will succeed is unknown at this point. Each of the hundreds of wannabe’s need millions of people using their sites and services to be successful, and how many such services can you and me, or even multi-tasking teenagers, utilize. However, in 1999 dotcom start-ups obtained initial financing from venture capitalists, but soon filed IPO’s and sold stock to eagerly awaiting investors. Today’s start-ups similarly obtain initial financing from venture capitalists, but most seem to then sell out to larger companies for small, and sometimes large, fortunes for their founders and venture capital backers, without the tedious task of going public. That limits the opportunity for investors to chase the excitement of social media stocks as they did the dotcom start-ups, their speculation restricted to just a handful of already public companies like Facebook, Zynga, and Google. So, while there may be a bubble in the number of social media start-ups, their success or failure will not have the same impact on public investors as the dotcom bubble. Daodarin points a finger at investment banks, brokers and analysts selling assets related to the bubble, and the media (since bubbles make for streams of exciting business news stories). However, while it’s possible to observe when a market is over-valued by traditional means, and even if it’s being force-fed by hype emanating from Wall Street or the Fed, if that market is in a bubble there’s no way to predict how much more over-valued it may become, or when the bubble might burst. Yet all bubbles do eventually burst. In fact we see individual bubbles form and burst around us all the time. Apple’s stock and gold are recent examples, as well as China and Brazil’s previously rip-roaring markets now collapsed into severe bear markets from their 2011 tops. So, if we can’t really tell if a market is in a bubble, and if so when it might burst, and assuming we don’t want to hold through such collapses, the best that can be done is to recognize when risk is high of at least an intermediate-term market correction, as many were successful in doing in regard to Apple’s stock, gold, and China and Brazil’s markets. By dialing back risk and preparing for the prospect of an intermediate-term correction, one will also be on the right side of the market if it turns out to be one of those fairly rare instances when it was not only an overbought market, but a bubble market due for a sudden bursting of the bubble. Personally, I’m really only seeing signs that the market is overbought on an intermediate-term basis, not over-valued to bubble proportions. But in that regard the negatives mentioned above that have some warning the market is currently in a bubble, can be taken as a need for caution. That’s particularly so when combined with the fact that Washington has already begun reversing its fiscal stimulus, cutting back on spending and raising taxes, the stimulus that has been so important in producing and maintaining the bull market, and the Fed is making noises about possibly dialing back its monetary stimulus. Sy is president of StreetSmartReport.com and editor of the free market blog Street Smart Post. Follow him on twitter @streetsmartpost. He was the Timer Digest #1 Gold Timer for 2012 (Gold Timer of the Year), as well as the #2 Long-Term Stock Market Timer.